Edward Rossiter (“Whiff of change in fuel switch?”, December 2) is right to praise those shipping companies that have decided to burn low-sulphur fuel at berth in Hong Kong. However, I believe he is wrong in thinking that a European company led the change. The then Hong Kong-based China Navigation Company, which is owned by John Swire and Sons and had been operating out of Hong Kong since Noah was a boy, switched to low-sulphur fuel not only at berth in Hong Kong but throughout the Pearl River Delta region, from January 26, 2008. At the time, they invited other shipping lines to follow their example, and we should all be delighted that this is now happening. I do not seek to belittle Maersk, whose environmental initiatives are impressive in scope and global in scale, but it was a local company which showed the way in Hong Kong. It is also encouraging to note that the majority of companies that have signed the charter are based in East Asia. Let’s hope the rest of the global shipping community will soon catch up. Most tugs, ferries and other forms of local craft already burn low-sulphur marine gas oil. It is the heavy bunker fuel on ocean-going vessels that is the major pollutant, and it is this that is now being significantly reduced, thanks to a handful of major shipping lines. Finally, I have been blaming the acrid smell which lurks above Stonecutters Bridge on the new sewage treatment plant located near the PLA Navy base and Government Dockyard. 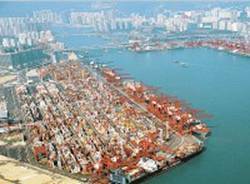 Orient Overseas Container Line is pushing for Hong Kong to become Asia’s first emission control area. The push is on for tighter ship emissions rules in Hong Kong. The company also says the government should offer subsidies to shipping companies to help meet their environmental obligations. OOCL director of corporate planning Stephen Ng says Hong Kong should make it mandatory for all players to abide by emissions rules and not rely on current voluntary standards. “We need a level playing field,” he said. Mr Ng accused the territory’s government of inaction. “As far as Hong Kong is concerned, what we want to see is involvement from the government,” he said. “The government needs to be in collaboration with the mainland. He was “not seeing active participation” on the issue by the territory’s political leaders, he said. Mr Ng said cooperation with the central government in Beijing, or at the very least with the provincial government in neighbouring Guangdong province, was required if a framework of standards were to make sense. He also said the government should consider subsidising the scheme. “We get a break in terms of ports charges,” Mr Ng said. The Hong Kong Government had a similar subsidy program in place for power companies, he added. Earlier this year, members of the Hong Kong Liner Shipping Association, including OOCL, agreed to a set of voluntary clean fuel initiatives aimed at reducing air pollution caused by emissions from ships.